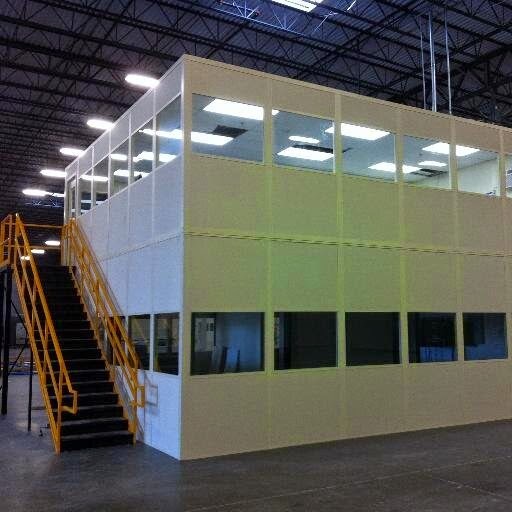 I just received this interesting article from Panel Built, a commercial panel builder from Blairsville, GA that ships a complete building to the jobsite and is erected on-site like a huge Ikea cabinet. When I built new homes in the '90s, I used panelized walls and had great success. If I were a new home builder today I would be using modular construction. This 13,000 sq ft office complex was sold through Indoff, Inc. to a large aerospace company in Jacksonville, FL. The project included five two-story office buildings installed inside of a large airplane hangar at Cecil Field. Four of the buildings measure 20' x 50' and the photo above is of the larger, 20' x 139' building. Each building included stairs and catwalk to access the second story and was designed so that no structural columns were required to support the second level...a feature that saved the customer nearly 25% in material costs!